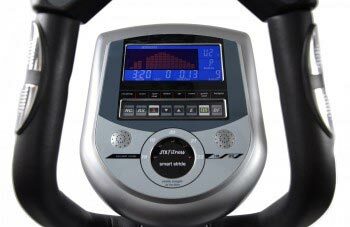 JTX is a leader in the fitness industry and features in our best home cross trainer guide. 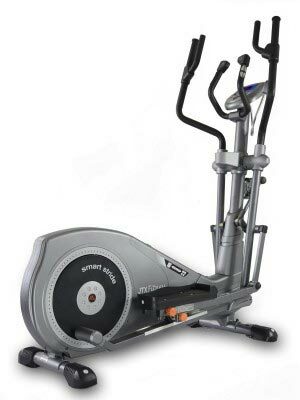 The SmartStride-Pro cross trainer lives up to expectation by offering just about everything you could ever want in an elliptical machine. With 24 resistance levels, adjustable stride lengths, multiple built-in programmes and an included heart rate chest strap, this is a machine that the entire family can use. We were thrilled to have the opportunity to give this machine a test drive, and we were more than delighted with the results of our workout. End of Line CLEARANCE SALE. Save £400. Limited stock available. The SmartStride-Pro is German-engineered and offers a gym quality workout right in the comfort of your own home. It’s compact, it’s space-saving and it’s highly durable. Did we mention that it’s quiet, too? One of the primary reasons why people reach plateaus is because they never vary their workouts. Eventually, your body adapts to the movement, and it becomes easy. As a result, you burn fewer calories and stop building muscle. The SmartStride-Pro comes with 24 built-in workout programmes, so you can change your routine often and avoid plateaus. We loved the fitness evaluation tests because they let us know where we stand, and made it easier to choose a workout that matched our fitness level. The evaluation programmes use recovery heart rate and body fat to determine your fitness level. The workouts vary, and include options for cardio, intervals, hills, fat burning and more. The SmartStride-Pro also comes equipped with 24 resistance levels, so you can adjust the intensity of your workouts. Other machines tend to be underwhelming in the resistance department, but the highest level is surprisingly difficult on this machine. Unlike other machines, the SmartStride-Pro comes with a chest trap to accurately monitor your heart rate. The strap sends your pulse information to the digital console, so you can stay within your targeted heart rate zone. It also displays the program and the user profile for added convenience. You can create profiles for up to five people. Navigating your way through the different workout programmes and resistance levels is easy thanks to the included buttons below the display. Just below these buttons is the built-in speakers and stride length selector. We also liked that the handlebars come equipped with buttons on the side that allow you to navigate the computer without ever having to interrupt your workout. The anti-slip footplates support foot positioning of 0-6 degrees, which ensures that your knees, ankles and hips are properly aligned during your workout. The handlebars are ergonomically designed, too, for added comfort. Unlike other cross trainers, which have bars that stand straight up, these protrude out and to the side for a natural, comfortable position when exercising. Both movable and stationary handlebars are included. The SmartStride-Pro is surprisingly easy to assemble despite its large footprint. Everything is neatly organized into assembly packages, and every step has its own set of nuts, screws and washers. That said, we do have to note that while assembly isn’t terribly difficult, it’s still lengthy. Expect to spend a few hours putting this cross trainer together. One feature that really stood out to us was the adjustable stride. Every person has their own stride length. Taller people tend to take bigger strides, while shorter people tend to naturally take smaller strides. With the SmartStride-Pro, you can adjust the length of the stride to match your comfort level and goals. There are four lengths to choose from: 18”, 19”, 20” and 22”. Longer strides will allow for high intensity “running” strides, while shorter lengths will allow for a natural walking stance. Multiple resistance levels allow you to adjust the intensity of your workout. Built-in programmes allow you to vary your workouts. Adjustable stride length accommodates users of all heights. Colour computer tracks your workout stats to help you reach your goals. Ergonomically-designed foot pedals and handlebars for a comfortable workout. Pulse sensors are not always accurate. The SmartStride-Pro’s pulse sensors are not always accurate, but this seems to be a problem with most handlebar sensors. The problem tends to be exacerbated if you have sweaty or wet hands. The sensors tend to give more accurate readings if your hands are dry, so keep this in mind when using this cross trainer. Overall, we felt the JTX SmartStride-Pro delivered a great workout, and we were able to alternate between forward and backward strides. We were also able to adjust the length of our strides to change from a running pace to a gentler walking pace. If you’re looking for a machine that will give you flexibility and variety in your workouts, the SmartStride-Pro is an excellent choice.